We’re still gonna need a bigger pool…. 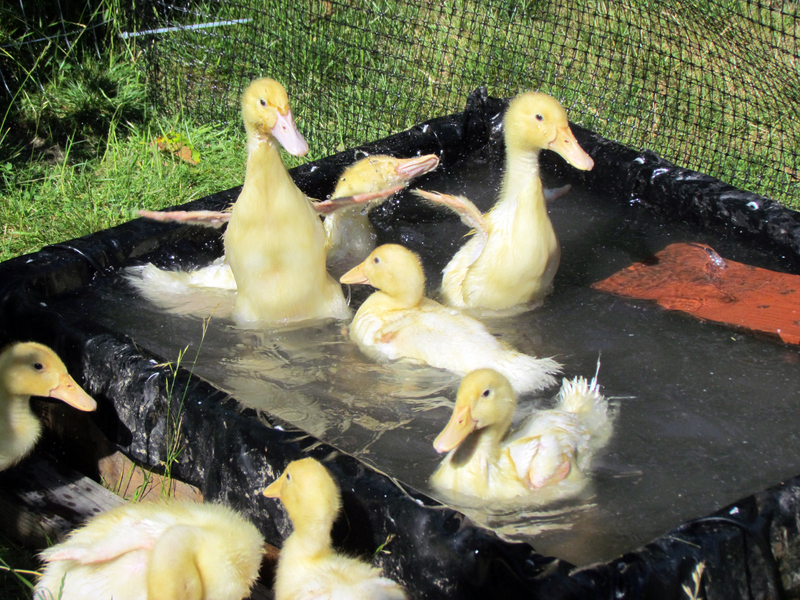 True to his word, Gene built a custom pool for the ducklings on his first day off. Although it looked spacious at the time, they’ve almost outgrown it already! But a fine pool it is – the black liner holds in the sun’s heat, and when I fill it to the brim it looks like one of those fancy infinity pools. Even better, it’s deep enough for them to swim under water in it! On Gene’s next days off, I think I’ll request a second pool, perhaps with a bridge between the two, or a water slide! Watching them frolic in the water has to be one of the cutest things in the world. 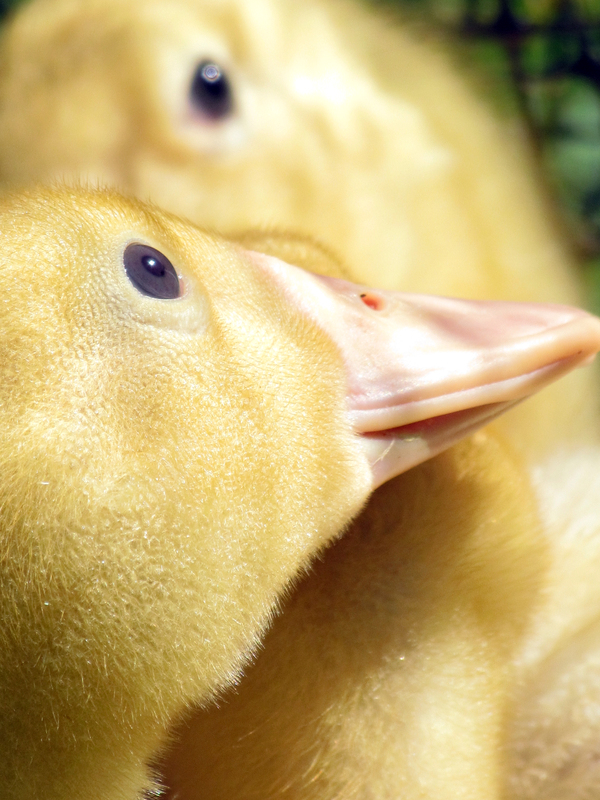 It’s impossible to be in a bad mood when you see ducklings paddling to and fro, occasionally diving under then submarining an unsuspecting sibling. When it’s warm out, they will spend hours playing in the water. They’ve started to get used to the whole shuttle bus routine – when it warms up outside I take them, two by two, to the play area and drop them off. They peep and cry frantically until all eight of them are together again, then fun time commences. As it starts to cool in the evening, I bring them back to the brooding box where they warm themselves under the heat lamp. At first they panicked when I picked them up, and I had to make sure I kept track of which end was pointed where, lest my pants be decorated. They may be relatively small, but they’re capable of holding in A LOT. Now they’re old shuttle bus pros, and seem to like the journey. If I thought Cinnabun wouldn’t pitch a fit, I would shuttle the baby bunnies out to the playground as well. She lets me pet them, but goes ballistic if I pick one up. 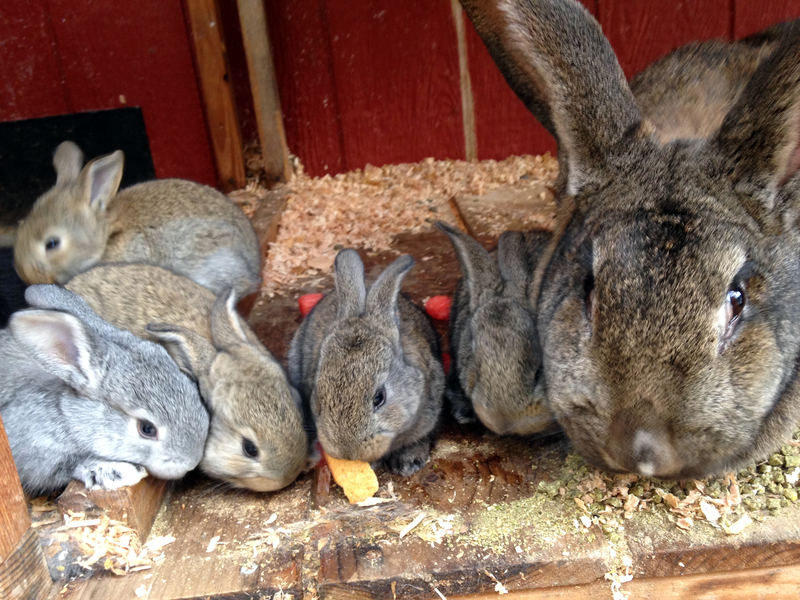 They are starting to hop around the Bunny Ranch now, and I’ve bribed them into friendship with Wheat Thins. They also love lettuce, carrots, and pretty much anything else I feed them. I’ve had to increase Cinnabun’s treat rations, since she’s nursing eight wee ones, but now I think I’ll have double it again since they’re tiny but voracious. I really wish I had remembered to plant lettuce.